Rihanna SUED Over Outstanding $150K Funeral Bill For Her Gran + Usher RELEASES "Thank You" Letter, Says Son Is "DOING WELL"
Rihanna (who's on vacay in Barbados) was recently sued for bailing on a $150K funeral bill for her deceased grandmother. Get the deets inside and read what Usher said about his son's progress. Rihanna (shown above on vacay in Barbados rocking her AK gun grills) has been accused of skipping out on the funeral bill for her beloved Gran Gran Dolly. A funeral company claims that following the burial of Clara Brathwaite in June 2012, the Bajan pop diva ordered a grand burial complete with tents, multi-media large screens and huge exotic floral arrangements for a big party....totaling $150K. Now, the company claims Rihanna paid only about a quarter of that total! Rihanna claims the bill was exorbent, so she didn't pay it in full. We guess no one discussed cost analysis before the big homegoing celebration. Fans concerned about the health of Usher's son, Usher Raymond V, can rest assured that "Cinco" is doing well. Though he's still in ICU, TMZ reports that he's eating, laughing and talking and will remain in the hospital a few more days. "I would like to thank my Aunt Rena as well as the doctors and nurses who are working with us around the clock. I would especially like to thank the two men who saved my son's life, Eugene Stachurski and Ben Crews," the singer said in a statement. "They are true heroes and I am deeply grateful to them." "I am blessed and fortunate to say that my son Usher V is doing well and is recovering. I am overwhelmed by the outpouring of prayers, love and support for my family's well-being,"
And how does the mother of Ben Crews want Usher to repay her son? By singing at his upcoming wedding. That's what she told TMZ. "Now that it's sunk in, she is livid. Usher has custody and won't let Tameka have the kids, even when he's out of town. She feels like the kids are being raised by his family or by nannies, when they should be with their mother." She has since been granted an emergency custody hearing that will take place tomorrow in Fulton County. Hmmm.....will be interesting to see how this plays out. PREVIOUS: EXCLUSIVE SNEAK PEEK: Michelle Williams Gets Her Hair "LAID" On "LA HAIR"
Rihanna is a complete fool. $150,000 sounds like and awful lot for a funeral, normally a contract is signed before anything is done, something sounds fishy here, I can't imagine that she would NOT pay for the cost of her Grandma's funeral, something is wrong, hopefully they will figure it out. So happy that the baby is doing better, classy of Usher to wait until things settled down a little to make a comment. Rihanna wasn't playing with Gran Gran Dolly's homegoing celebration. I just hope that bill gets figured out. Ushers momma is to blame she hates Tameka and has made Usher spiteful and hateful and this is the consequences. If he was smart he would let Tameka have the kids when he is working. He would have used this to get custody of his boys if it happened on Tamekas watch. 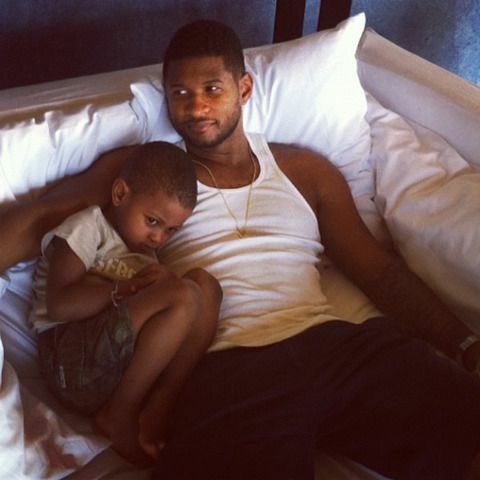 Cute pic of Usher and his son. I am glad to hear he is doing fine. Usher needs to just keep these kids away from water, period!